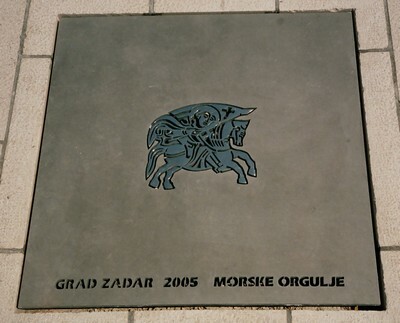 Abstract: The paper deals with the acoustical and musical solution to the newly built urban musical attraction in Zadar, Croatia, named "Morske orgulje" ("Sea Organ"). The said installation is implanted into the stony stairy promenade alongside the seashore. The 35 organ pipes are built subterraneanly, into tunnels attached to the flank of a central service channel. Each organ pipe is blown by a column of air, pushed in turn by a column of wave-moved water, through a plastic tube immersed into the water. The pipes' sound emanates to the surroundings through appertures in the vertical planes of the uppermost stairs. The 7 successive groups of pipes are alternately tuned to two musically cognate chords of the diatonic major scale. The outcome of played tones and/or chords is a function of random time- and space distribution of the wave energy to particular organ pipes. In addition to the customary presentation of technical drawings and photos, an audio recording of organ sounds caught at the location in various weather conditions will be reproduced during the paper session. Following the recent "live" experience on site, the overall acoustical and musical result will be discussed in detail. Fig. 1. 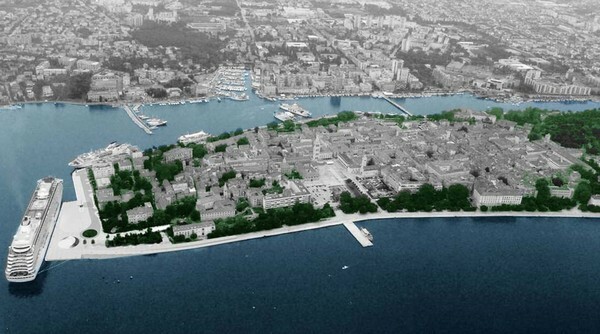 Zadar downtown peninsula before beginning of quay-building works. 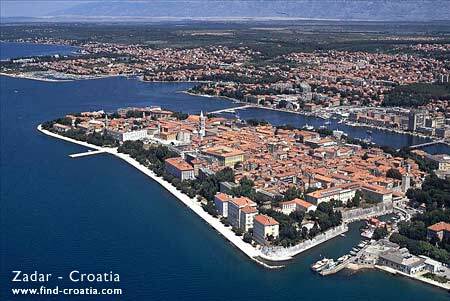 The Croatian littoral town Zadar has, according to the historical sources, almost 3000 years of urban tradition. Nowadays, it is the 5th biggest city in this country with one of the most propulsive economies among the cities alike. Positioned in the middle of the Croatian Adria coast, Zadar has ambitions to be a flagship in tourism especially taking into account its rich historic and archeologic resources and the qualities of its natural surroundings. A very specific advantage in many aspects is the microlocation of its city core on a natural peninsula (Fig. 1.). One of the recent moves in the touristic upgrading of the city was the adaptation of the Peninsula's outermost pier for accepting biggest cruising ships. The idea was to enable the cruiser passengers to disembark literally downtown, in the very heart of Zadar. The architect in charge, Mr. Nikola Bašić, made another step forward in the enrichment. He implanted a coastal promenade with an attractive staircase in the closest vicinity of the cruiser quay (Fig. 2). Yet, this was not enough: he meditated on how the pattering sound of inundating waves could be ennobled by some melodious sounds that the wave energy could generate. In search for a right solution Mr. Bašić engaged the present author both as an acoustician and composer. The task was to develop the idea into a feasible product that could be completed in due time to match the building plans. We both agreed that the use of organ-like pipes for the purpose has been a logical choice, and that's how the Sea Organ was conceived. Mr. Bašić formed the task group which included, besides the present author, Prof. dr.sc. Vladimir Andročec for hydraulics and the organbuilder Mr. Tomislav Faullend Heferer for the design of organ pipes. 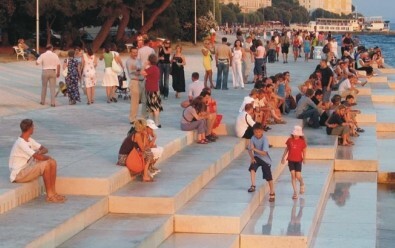 The Zadar harbour and city authorities accepted the case study and the overall design of the Sea Organ in early autumn 2004. 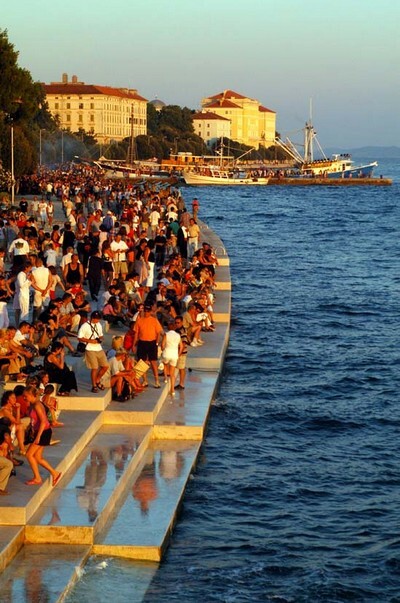 The Zadar cruiser pier including the Sea Organ had its opening ceremony on April 15th, 2005. Fig. 2. New cruiser quay with Sea Organ, rendering. Fig. 3. Stairy promenade with Sea Organ. Fig. 4. 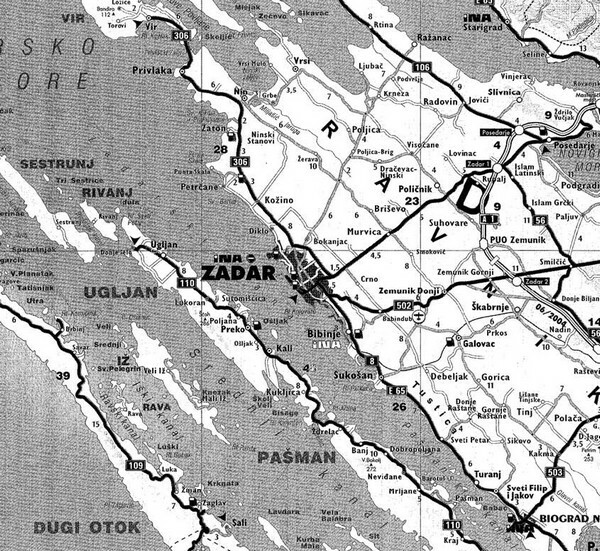 Map of Zadar Channel. A close photograph of the finished stairy promenade is shown in Fig. 3. As seen on Fig. 2, the position of the staircase is fairly close (55 m) to the nearest apartment house. Thus, it shall be duly considered for the potential sound annoyance suffering. The coastal line at the location is stretched Southeast - Northwest. The roughly westbound semicircle is the main source of winds to generate effective waves. Of winds there, the most wave-energizing ones come from south and southwest. From the spot, a sea channel 4 to 5 km wide separates the Peninsula from the nearest island Ugljan (Fig. 4). The maritime traffic through the channel is quite busy and includes ferries, fishing ships, even gross cargo ships and tankers sometimes. Their cutting waves can cause there the sea motion in a considerable part of time. While the Adriatic sea is truly a deep bay of the Mediterranean sea, the tide amplitudes exceed 40 cm only seldom. But the Ťdead seať, the situation with long waves during the quiet weather is frequent. Thus, the sea surface is here practically in the perpetuous motion. The determining fact for the start of organ design was the finite outline of the stairy promenade as designed by Mr. Bašić. It shall be 70 m long and divided into 7 sections. Looking from the mainland, the rightmost section shall contain 8 stairs, the deepest one being submerged under the average sea level. Each successive section shall be 1 stair shorter than the previous one. So the leftmost section has got only 2 stairs. This is well visible in Fig. 3 and is technically depicted in the drawing Fig. 5. The sound source should be located under the stony pavement. The vertical planes of uppermost stairs only shall have appertures towards the sea, for the sound to emanate. Taking all these elements into consideration, the task group adopted the approach to the solution. Fig. 5. Sea Organ, ground-plan and front view. Fig. 6. Tube-pipe tandem, architect's sketch. The folowing physical model has been adopted. One end of a suitable plastic tube is partly immersed under the sea surface while the other end that contains the air is attached to the "foot" of an organ-type pipe. The moving water inside the tube presses the air column which then forces the pipe to sound. 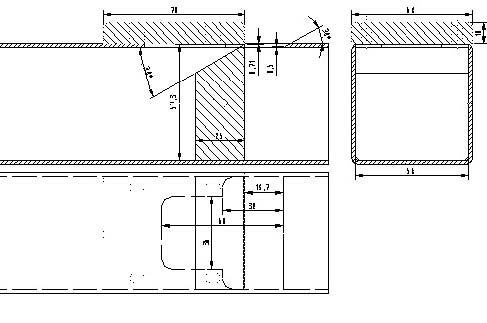 This basic configuration shall be shaped to fit the stair construction and physically optimized for hydraulic, pneumatic and acoustic parameters. A typical constructive detail of this configuration is shown in Fig. 6. The system begins under the average sea level with a horizontal entry tube, coated by an antivegetative layer and laid below the deepest stair. The tube then rises obliquely up reducing its diameter in order to increase the velocity of water inside. The upper part with the air inside bends back to the horizontal, enters into the service corridor under the promenade pavement and matches to the organ pipe's foot. The pipe's resonator further transverses the channel horizontally and protrudes into the lateral tunnel which houses it. It was decided to adopt stopped flue pipes (pipes with mouths  labiums and with tuning stoppers) because of their "rounded" timbre as well as of their minor sensibility to the aggressive sea environment, in contrast to the reed organ pipe. All the pipes are made of inox square profiles. In Fig. 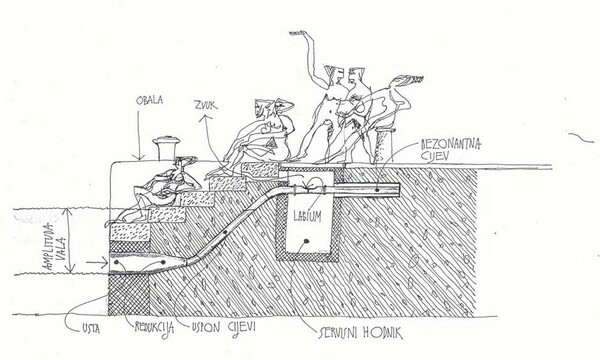 7, the drawings of the typical pipe are shown. The total of 35 tube-pipe tandems is inbuilt and distributed into 7 sections along the scalinade, each section housing 5 pipes tuned to a musical chord. The service corridor embraces all the 35 pipes, and all the pipe mouth units are serviceable inside it. The organ sound is allowed to spill out into the environment through a series of appertures at the vertical plane of uppermost stairs along the entire length of the scalinade. It is self-evident that the energy distribution of waves that strike the quay is random in time and in space. So it was expected that the sounding of flue pipes may at any time reach the extremes of any and all of the possible musical characteristics: loudness, dynamics, tone clusters, tone series (i.e. melodies), tone attack, artifacts like overblowing. Such a chaotic sounding would not match the strivings to "ennoble" the wave hum; on the contrary. It was thus necessary to control and restrict the span of possible tonal characteristics, both musically and acoustically. The consequences of this control shall apply to the work of both the organbuilder and the building contractor. Intending to be a real urban musical attraction for promenaders, both domestic and guest ones, the Sea Organ must play pleasing and harmony sounds. Further, the Sea Organ should reflect a local urban musical tradition. In this part of Croatia the prevailing musical tradition is the spontaneous four-voice male singing, with melodies and chords conformed to the Europe's autochthonous diatonic major scale. As noted, the instalation's 35 flue pipes are grouped into 7 successive sections. The 5 pipes of each section are arranged with ca 1,5 m spacings. One listener, standing or sitting on a chosen point on the scalinade, should be able to hear well 5 to 7 nearest pipes i.e. mainly those housed inside the relevant section. Thus a logical choice is to tune a whole five-pipe-section to one chord. This chord shall contain tones out of the said diatonic major scale. Further, it seemed appropriate to alternate along the whole scalinade two different but the harmonically cognate chords. The sequence of chords g - c6 - g - c6 - g - c6 - g was chosen to tune 7 sections from NW to SE. This combination of tones sounds pleasingly even under extreme circumstances of perpendicular waves when all the 35 pipes may sound simultaneously, in cluster. In all other circumstances, Sea Organ will perform monophonic, biphonic and/or polyphonic tone series, much in a way how the mouth-organ players perform. The Grand and Small musical octaves (frequencies between 65 Hz and 250 Hz) were chosen for allocation of tones to the pipes. The flue pipes emanate their noblest sonority in these octaves. Their sound discreetly resembles the human male voice, and that is needed for the ambiental demands as noted. The pipes are tuned to chord tones as follows: D, G, d, g, h (odd sections) and C, G, c, e, a (even sections), respectively (Fig. 8). Fig. 8. Tuning scheme of Sea Organ. Due to the predetermined constructive and architectonic solutions, a little space has been left for acoustical refinements. The sound originates literally in the underground and develops in a nothing but the catacomb. It emanates to the environment only through the series of narrow channels ending as appertures in the vertical planes of the stairs. Yet, we are not dealing with a church or a concert hall organ. This particular "instrument" doesn't play Bach or César Franck. On the contrary, its underground sound has a good reason to be peculiar and mysterious. Further, the variations in sea forces and consequently in loudness of played tones positively exceed the expected SPL variations from sound standing waves in underterranean enclosure. As is depicted in Figs. 5 and 6, the enclosure where the pipe sound develops consists of a 70 m long service corridor and of 35 flanking tunnels which encase the pipe resonators. The total calculated volume doesn't exceed 150 m3 . It can hardly function as a reverberating enclosure, rather as a waveguide using its hard concrete walls and ceiling (if one neglects inevitable bottom mud). Given that the uppermost horizontal edge of the corridor contains all along towards the seaside dense flanking appertures, this is the only passage for sound to emanate. It was estimated that by action of the waveguide a maximum of 10 pipes (2 chords) can be heard on a spot. With the operating frequency band chosen only the highest-pitched pipe sounds will radiate towards the sea. The majority of the sound spectral contents will be heard not only at the scalinade but at margins of the nearby park and houses. We estimate that the SPL at the nearest house (55 m) will not surpass some 35 dBA in 90% of total time. If sound annoyance would be registered during the first period of operation the measures shall be taken to reduce the SPL. Three solutions to such a problem are envisaged: 1) by reducing the hydraulic pressure in the entry tubes, 2) by choking up a certain percentage of appertures, 3) by adequate damping the interior of the enclosure. The right measure or a combination thereof will be decided upon after a suitable period of monitoring. Fig. 9. Service corridor comemorative lid. The installation of the Sea Organ has been completed end - March, 2005, a fortnight before the opening ceremony. Since then, the pipes have been active all the time, night and day. The lot of people reportedly visits the new city attraction, mostly with enthusiasm. The internet polling among Zadar citizens (as on May 6th, 2005) resulted thus: affirmative 77.9%; indifferent 9.3%; negative 12.7%.
" The overall sounding generally matches the original design idea and expectations.
" No more than 5 to 6 pipes can be heard at a time on a standpoint.
" In some extreme weather situations the loudness was exaggerated.
" Some of the flue pipes occasionally overblow. The task team firmly recomended to the Zadar authorities to organize a monitoring of the Sea Organ operation during next 6 months (at least) in order to encompass the vast majority of various weather features. A resident person, preferably an experienced musician, should be instructed to monitor and record the peculiarities of the sound and to measure sound pressure level in dBA on the spot. Following this period, the task team will recommend the necessary measures to optimize the Sea Organ operation in all aspects. The author wishes to thank Messrs. Nikola Bašić, Tomislav Faullend Heferer and Ante Petrina for their dedicated cooperation in preparing this report and for the supply of the technical documentation items from their expert field. 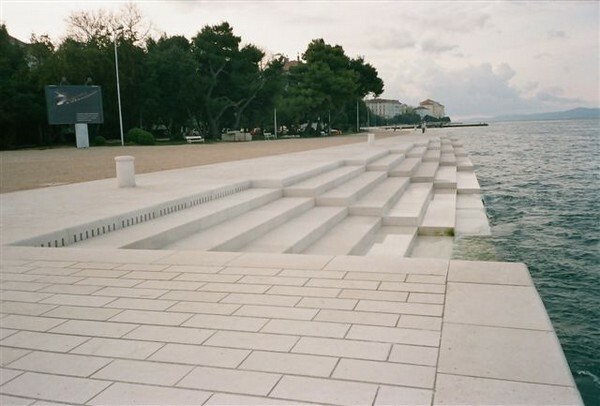 Sea Organ is situated near the new cruiser port, as a part of Zadar's Riva, and can be observed as a differently shaped part of the coast which consists of several stairs that descend into the sea. The stairs extend for about 70 meters along the coast, under them, at the lowest sea-tide level, 35 pipes of different lenght, diameter and tilts were built in vertically to the coast and they raise aslant until the paved part of the shore and end in a canal (a service corridor). On the pipes there are LABIUMS (whistles), which play 7 chords of 5 tones. Above the canal there are perforated stone stairs through which the sound comes out, the air pushed by the sea. This site is a blend of human ideas and skills and the energy of the sea, waves, tide and flood, a place for relaxation, contemplation and conversation while listening to an endless concert of mystic harmonies of the "Orchestra of Nature". Sea Organ is constructed according to the project made by architect Nikola Bašić with the help of several experts: Professor Vladimir Andročec was the sea hydraulics consultant from the Zagreb Civil Engineering University, the pipes were made by Goran Ježina from Murter, a well-known organ art workshop - Heferer from Zagreb made 35 labiums for every pipe, and it was tuned by professor Ivica Stamać from Zagreb. 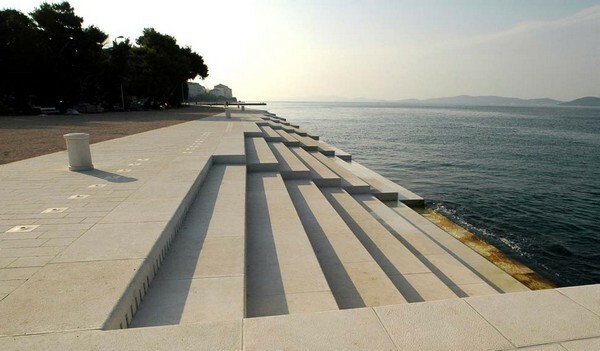 The Sea organ is an architectural object located in Zadar (Croatia), which plays music by way of sea waves and tubes located underneath a set of large marble steps. The waves create somewhat random but harmonic sounds. The device was made by the architect Nikola Bašić as part of the project to redesign the old city coast and the site was opened to the public on April 15, 2005. The Sea Organ successfully brought to life the far end of the Nova Riva, drawing tourists and locals alike. It is now a center for gathering, a good destination on a walk through town, and also a great place to enjoy Zadar's exceptional sunset. Croatian poet Joja Ricov named the City of Zadar "a stone vessel" - "kamena lađa"
Acknowledgements. 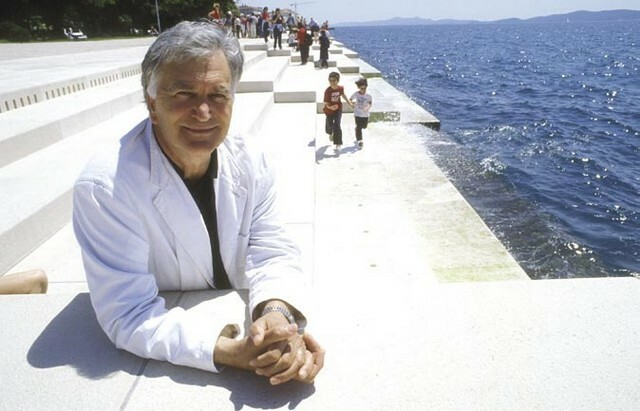 Many thanks to Mr. Nikola Bašić d.i.a., for help with basic data about his project of the Zadar Sea Organ, and to Prof. Dr. Ana Marija Grancarić, University of Zagreb, Croatia, for contributing sound file. Ako netko ¾eli poslu¹ati zvuk orgulja, ja ga imam snimljenog nekoliko sekundi u svojem videu na stranici www.croatia4you.wordpress.com/zadar/. It's good to remember Zadar this way. I am glad to listen to the organ this way, because it sounds quite as it sounded a week ago in Zadar. To me Zadar was the most wonderful place I discovered during my 20-days stay in Dalmatia. I arrived there on 4 of August, enjoyed the national day there, went to Olib the next day - where I definitely would like to come back as well and stay there - and was happy to celebrate the full moon festival in Zadar the same day. Thanks also for the sun salutation and regards to Zadar!!! 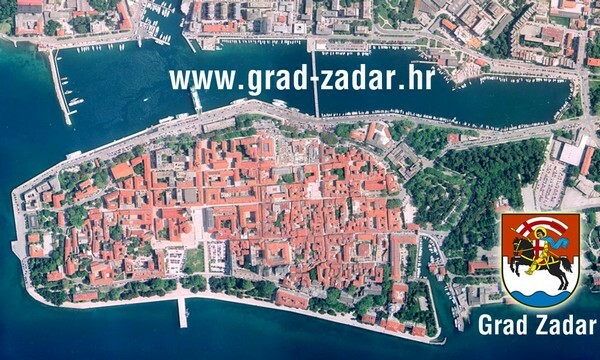 I'm the diretor of Revista Iate, a Brazilian magazine; I'm writing about the sea organ in Zadar but can't find good high resolution photos even in image banks. Can you help me? I started planning a Zadar-Bar-Mostar-Zadar bicycle tour yesterday and coincidentally found out about the Zadar sea organ today on metafilter.com, which made me even more excited. I can't wait to visit Croatia, Montenegro, and Bosnia-Herzegoina!